Find out a little more about the Revolution NMR products available through TalaveraScience! Revolution NMR manufacture and service wide bore solid state NMR probes and consumables. TalaveraScience is the sales agency for Revolution NMR throughout Europe. Revolution NMR has also, in collaboration with Bruker BioSpin, developed the Agilent to Bruker (A2B) programme which allows the continued use of Chemagnetics, Varian and Agilent PENCIL MAS NMR probes when replacing consoles to the latest Bruker NMR instrument offering. This allows the spinning speed control and, in some cases, variable temperature control by the Bruker BioSpin environmental controllers. Revolution NMR works in close collaboration with Phoenix NMR and provides rotor parts for each of Phoenix NMR's probes. 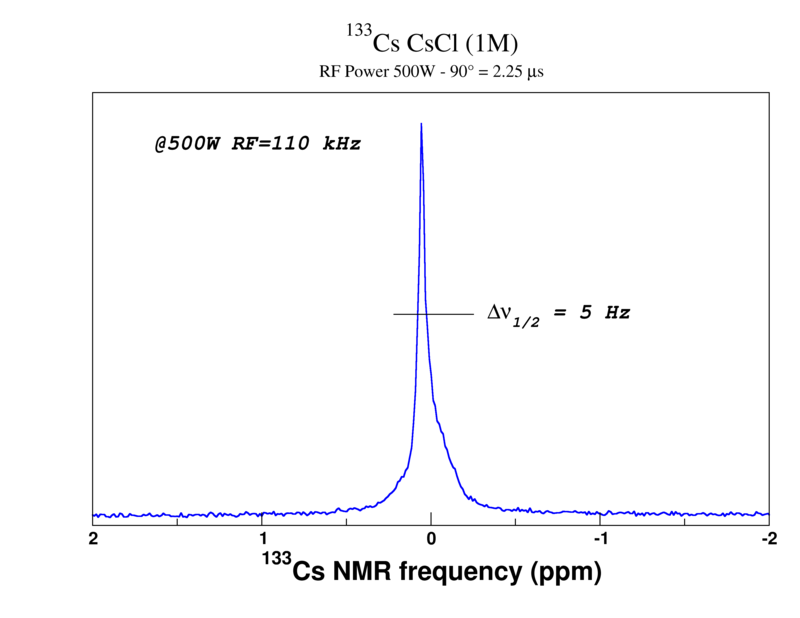 Revolution NMR provides service for Chemagnetics and early Varian solid state NMR probes. 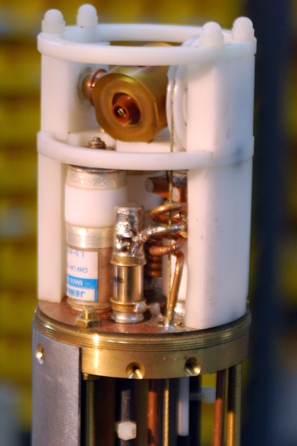 custom probe development such as the cryogenic MAS NMR probe, the MSS probe and dynamic angle spinning probe. The Revolution NMR probes depicted to the left are a DAS NMR probe and to the far right, a 4 mm MAS NMR probe. Please contact us if you would like to receive any information at info@talaverascience.com. 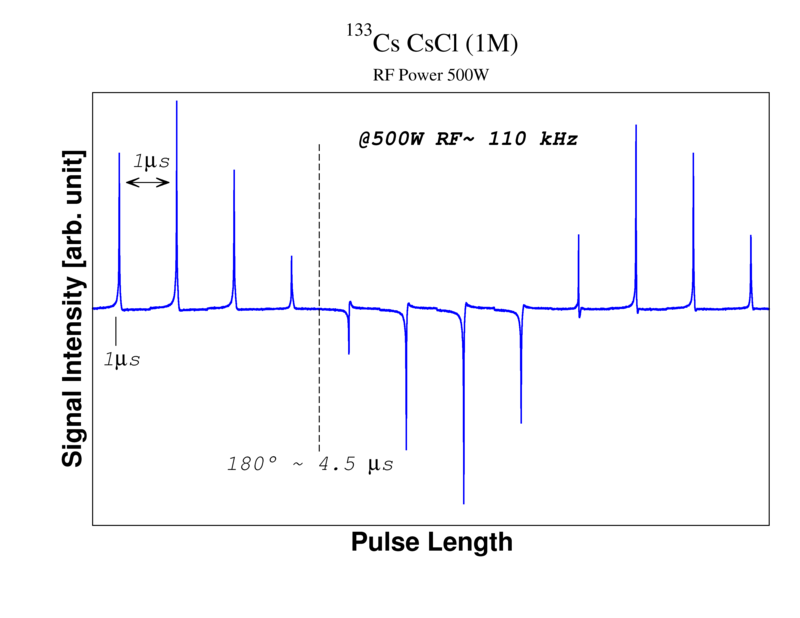 The two spectra depicted above are results from a Revolution NMR 3.2 mm double resonance (HX) MAS NMR probe installed on a Bruker BioSpin 500 MHz NMR spectrometer measuring 133Cs NMR of 133CsCl(aq) at 1 M concentration. The image above left demonstrates the nutation curve for 133Cs and its correspomding lineshape is demonstrated in the image depicted above right. 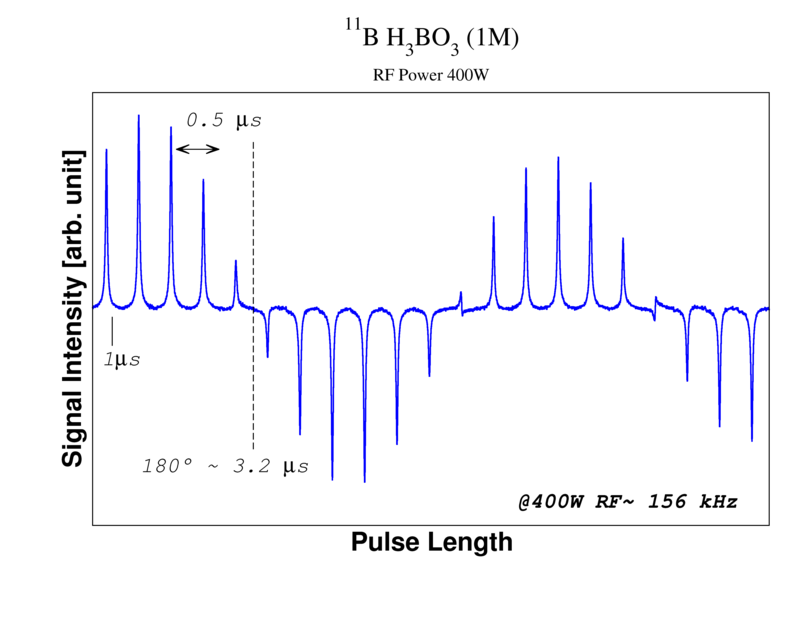 The image depicted below left is of the 11B nutation curves on 1 M aqueous solution of H3BO3. 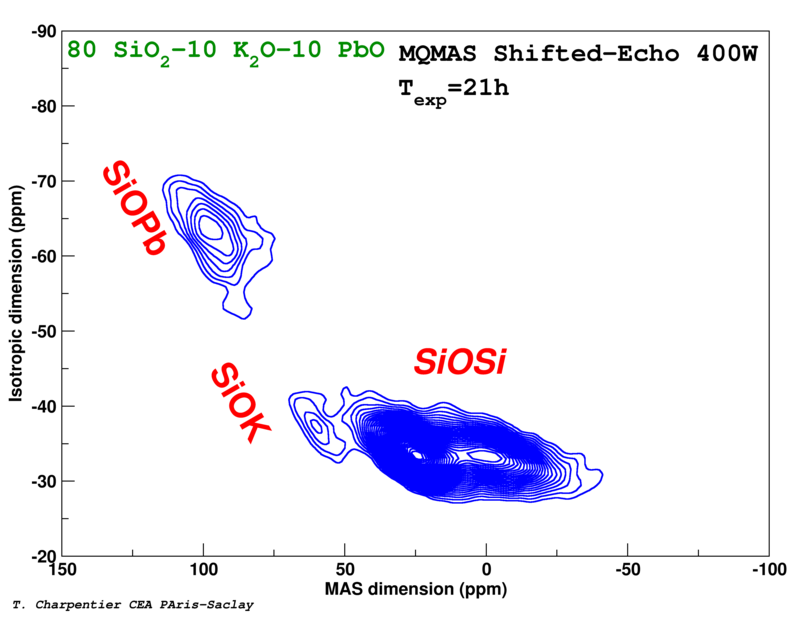 The 17O MQMAS NMR spectrum depicted bottom right is of the glass with composition 80% SiO2, 10% K2O, 10% PbO enriched to 80% with 17O acquired with MAS rates of 17 kHz. See Frédéric Angeli, Patrick Jollivet, Thibault Charpentier, Maxime Fournier and Stéphane Gin, Environ. Sci. Technol., 2016, 50(21), pp 11549-11558, DOI:10.1021/acs.est.6b02971 for more details concerning the sample and the experiment. Please reference this publication if you save this spectrum to your computer and use them elsewhere. All the spectra shown are provided courtesy of Dr Thibault Charpentier. Please contact us if you would like to receive more examples at info@talaverascience.com. High pressure MAS NMR using standard Chemagnetics, Varian, Agilent and Revolution NMR probe technology: Second Generation High Pressure MAS Technology. The patented second generation high pressure magic angle spinning technology design developed by the team led by David Hoyt and Eric Walter are exclusively licensed to Revolution NMR from Battelle Memorial Institute as operator of the Pacific Northwest National Laboratory (PNNL). Their design eliminates the need for the large pressure chamber in the original design bringing pressures up to 300 bar and temperatures up to 250° C can be achieved through a modified rotor and a set of o-rings along with a pressure source and a simple tool set. The figure depicted above left demosntrates the assembly sequence of the rotor and that above right demonstrates temperature variation of the ethylene glycol 13C MAS NMR spectrum at pressure. The figure to the right is of the transparent schematic view of the high pressure MAS rotors. The high pressure MAS rotors are available in 5 mm and 7.5 mm diameters for Chemagnetics, varian, agilent and Revolution NMR probes. 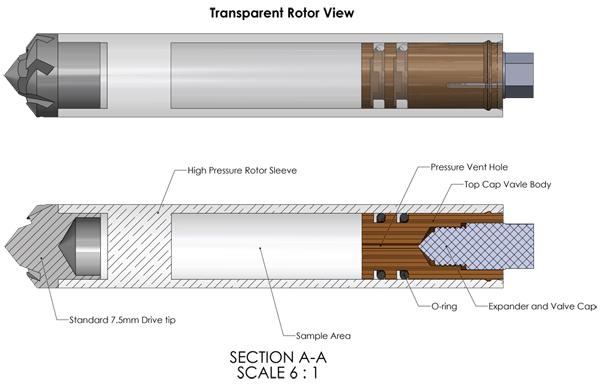 The 5 mm rotor is rated at 5 kHz spinning speed at maximum pressure, while the 7.5 mm rotor is rated to 3 kHz. High speeds are possible at lower pressures. Please contact us if you would like to receive additional information at info@talaverascience.com. By the timeof the exit of Agilent Technologies from the NMR market, several solid state NMR groups have accumulated a large number of Chemagnetics, Varian and Agilent MAS NMR probes representing significant value. 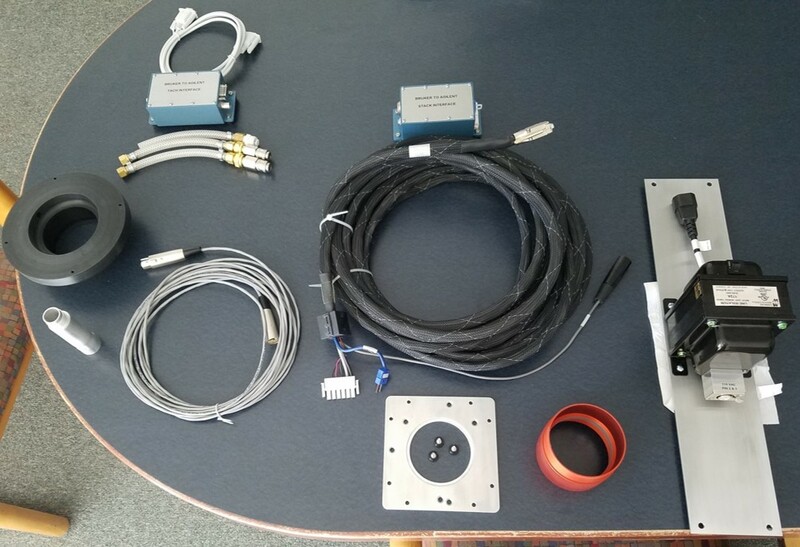 Bruker BioSpin and Revolution NMR have collaborated to produce a kit that allows these probes to be used directly on Bruker NMR spectrometers allowing them to be controlled by the Bruker spinning speed controller and, where appropriate, the Bruker VT controller. the variable temperature A2B components which include adapter plates to mount probes to Bruker shim coils, mechanical adapters for the VT-transfer stack, mechanical adapters for the Johnstone coupling, interface boxes to run the VT stack (NB, please do not dispose of your VT stack!). A checklist is completed to ensure that compatibility is achieved. 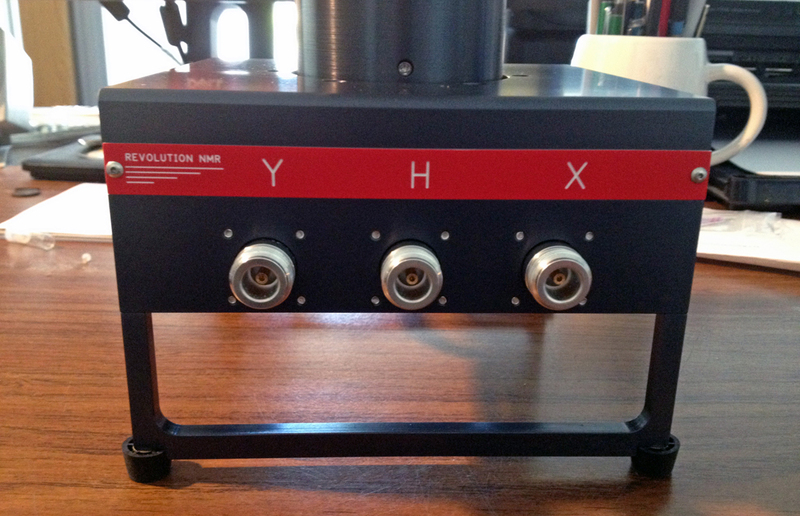 The A2B kit is produced and serviced by Revolution NMR. This can be purchased directly from Bruker BioSpin or Revolution NMR (through TalaveraScience in Europe). Revolution NMR provides PENCIL MAS rotors for 1.6 mm, 2 mm, 2.5 mm, 3.2 mm, 4 mm, 5 mm, 6 mm, 7 mm, 7.5 mm, 9.5 mm and 14 mm spinning systems. We have a wide range of variants available for most of the rotors including thin-walled version, sapphire, low-Al zirconia and cavern-style rotors as well as the high pressure MAS rotors discussed earlier. Revolution NMR has methods to constrain liquid samples or air sensitive samples in the MAS rotors including ampules at 6 mm and end and top caps that seal to the rotor sleeve for a wide range of rotor sizes. and are compatible with all Chemagnetics, Varian, Agilent and Revolution NMR rotors. Revolution NMR offers cost effective solid state NMR probe service for Chemagnetics and older early Varian probes (newer Varian and Agilent solid state NMR probe service is offered by Phoenix NMR). 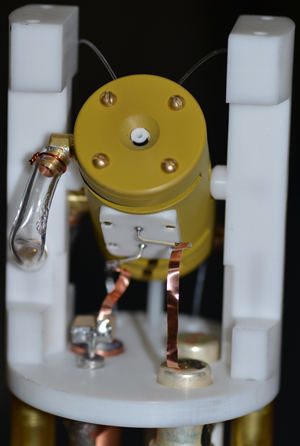 Revolution NMR works with you to identify the most cost effective method to get your probe back up and running again. Services offered, but not limited to, include all spinning problems, crashed rotors, broken RF traps and other probe issues. If you have an issue, just contact us to discuss it! Revolution NMR manufactures the coil components and sample holders for Peter Gor'kov's static eFree NMR probes; please contact us for more details! Other manufacturers' rotor accessories can be ordered from Rototec Spintec; speak to David Cross at http://www.rototec-spintec.com. All downloads require a webform to be completed before the datasheet is downloaded. Clicking the 'Remember me' on this computer will automatically complete the title, first name, last name, email, telephone on all of the forms saving a considerable amount of time. This does not use a 'cookie'.